We all have a history and things we pass down to our children and them to theirs. I have talked in the past about family stories and their importance. Remember? Keep talking and telling these stories, as they become the base for future generations. I love learning about multiple tribes and their beliefs, even though they may be a bit different than ours. Native American legends are plentiful, and here in the Southwest, history does not overlook us. I love the stories that have been handed down generation to generation. They always have a moral or two regarding the Creator, Mother Earth, Father Sky, the four-legged and two-legged earth inhabitants with a sweet flavor of truth. The oral traditions are heartwarming and allude to good versus bad or evil, referencing how one might choose to walk their path. As taught by our elders, we somehow triumph in the end or have cognitive realization of a lesson well-learned. This is a story about the Superstition Mountains, the Lost Dutchman and the Native American stories combined. No one can prove or disprove these, although there are incidents that would suggest dark mysteries. One would be the “Ark of the Superstitions,” a legend of the Pima relating the stories of the great flood and the torment waiting for another to return and drown out the evil of man. The stories say the devil lives on the backside of the mountain. That tale is alive and well today. The mountain is considered sacred ground. Records of centuries’ past document many who went into the mountain and were never heard from again. Some miners found gold but died questionable deaths. Then there were the Spaniards, who were massacred because they dared to enter the sacred place and remove gold in abundance, thus tormenting the Thunder God. According to Apache Indian legends, the Thunder God protects the Superstitions. He is most prevalent and announces control through storms and heavy weather during summer months. The Superstition Mountains inhabitants have included the Hohokam, Apache and Pima. You can look at the Superstitions each day, and it is never the same. Lavender and orange hues add to the complexity. The dark shadows alter daily, as does the weather. I climbed to the top of the Superstitions some years ago. It was a full day up and down with a guide and all the stories he could share along the way. The decline occurred on my backside, as I recall. There were instructions and expectations of respect as you hiked the magnificent, ever-changing mountain. You were never to remove anything alive. If you pick up a rock to examine it, it must be gently returned to its place. Do not throw the rocks. This is their home. That would be an intrusive act and against all He created. You are a guest. Some say rocks, or Rock People, hold all the information of all time. The adoration of the Superstations has lived long. They are continually being researched, mined and admired from around the world. You can take a three-day camping trip on horseback for the experience, should you so choose. I have a good friend who did just that. While in the base of the Superstitions during a camping tour, he talks about a Native American woman who visited in a vision. He said he felt somehow changed by the experience and stayed very close to his story. Being absent to that moment, I cannot vouch for his experience. However, the look on his face as he told the story would confirm it was real to him at a minimum. Through the ever-surging stories of gold “in them thar mountains,” Goldfield, now Goldfield Ghost Town, was established as the gateway to the Superstitions. It was originally established because of all the gold found in the mountain. The town has been rebuilt at least twice, staying as close to its original state as possible. It is now open to the public. Then we have San Xavier Mission. It has become one of the most popular missions in the Southwest. Built in the 1700s on what the Tohono O’odham believe to be sacred ground, many have lost their lives protecting it. The legend is that the artwork molded into the mission front warns of the coming end of life as we know it. Most people see the design without realizing there is a mouse on one side and a snake on the other. There also is a slight figure of a man who says the end of times is imminent when the snake and mouse meet. A story about the sighting of a self-sacrificing nun attempting to save five children when the schoolhouse burned down is told regularly. The suggestions are considered to be the unrest of their spirits that bring them back. Next, we have the Navajo legends of skin-walkers, entities who can project themselves as an animal or human, but their intent is to do harm. The legend says they will never wear the skin of the animal they have chosen. The Navajo people have a creation story about the corn people, which is much different from ours. However, it is interesting to hear. One of my favorite legends is the Potawatomi story of the Seven Grandfathers. “What are the teachings of the Seven Grandfathers,” you ask? The Seven Grandfathers legend is the teaching of love, courage, humility, honesty, respect, wisdom and truth.There are opposites to each of these and you have a choice in the path you walk. Many of our legends are under the Language Department’s section on our website. They are interesting, educational and something you can share with your children and grandchildren. No one tells our creation story like Tribal Chairman John “Rocky” Barrett. He is animated, heartfelt and charismatic in the art of storytelling. I wish we had it on CD. It has been suggested but has not come to fruition to date. The marine aquarium holds more than 2 million gallons of water over 200,000 square feet. We will start our meeting at 10 a.m. with greeting those we have not seen since last year. Noon will be the dolphins’ introduction, followed by lunch, before continuing on to complete our business meeting. For those of you who would like to see Butterfly Wonderland or other exhibits, they will be allowed independently and individually at the group rate. There is so much to see. I am excited. 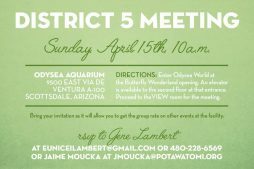 If you are visiting or would like to attend from Nebraska, New Mexico, Colorado or parts of Texas, you are definitely a part of District 5. If you are Citizen Potawatomi, you are welcome. I look forward to seeing you all each year. Bring the whole family. There is something for everyone. If you know someone who has not attended because they are a little nervous, put them at ease. It’s good food and good people, and there’s no better way to spend part of your day.